The Excelsior range of cutting tools - including gouges, scrapers and cutting tips - are made with a plasma bonded titanium nitride - TiN - finish layered over triple tempered high speed steel. Robert Sorby claim this provides the perfect combination for tool longevity and edge retention. I was given a 12mm (1/2in) spindle gouge to test and Mark had the 13mm (1/2in) gouge. The gold coloured shaft certainly looked distinctive. 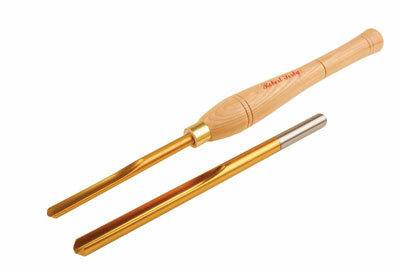 The depth of the flute on the spindle gouge was shallower than the other 12mm (1/2in) spindle gouges in my tool rack. This could be beneficial for turning tight details on spindle work. My first task was to reshape the edge profile to more of a swept-back grind. Once the layer of plating on the bevel was ground away, the tool appeared to grind as easily as any other high speed steel tool. When using my grinding jig, I noticed that there was only 19mm (3/4in) of flute remaining behind the jig I was using. Not a big problem, but some jigs don't like gripping on round bars. Maybe a little extra flute length could be looked at for future. I know that this will reduce the stiffness of the tool a bit but may help other jig users. Once sharpened I put it to use on a variety of different species of wood. The gouge seemed to cut very easily and without effort. Included in the test pieces was some very dry old burr oak (Quercus robur) with bark inclusions and the finish from the tool on this was as good as I could have expected. The hardened coating is intended to reduce wear on the cutting edge. 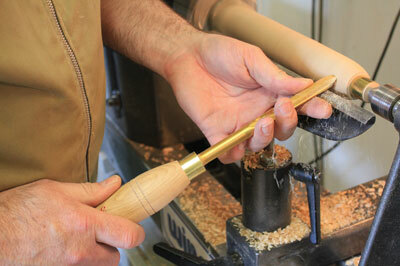 It will work on the top surface or on the flute of the tool but not on the bevel, which is ground away to sharpen it. The coating means you cannot hone the flute or the top face of scraper tips. The technology has been around for a long while on engineering tools and cutting bits and this sharpening off on one face does not seem to be a problem for these. I didn't get to test any scraper tips but it would be interesting to see how the TiN coating performs in conjunction with a raised burr cutting edge. The reduced wear and improved durability of the cutting edge of the tool are very difficult to quantify but from my limited tests, the tool I tried out did seem to need sharpening slightly less frequently than an equivalent tool without the TiN coating. They are very nicely made. When woodturning we use no constants: the speed of the traverse rate and changing speed as we cut across various sections of the project, pressure used and timber varies all the time. That said, I too found that the tool required less sharpening than when compared to a standard Robert Sorby M2 HSS bowl gouge.